For orders lodged by telephone or email, you can submit payment to Bairnsdale Camping & Outdoors using the secure PayPal credit card payment processing gateway. First, you may like to “Create an Account” or “Sign In”. Enter your payment details above. Proceed through the 3-step Checkout. Arrive at the secure PayPal website to process your payment. 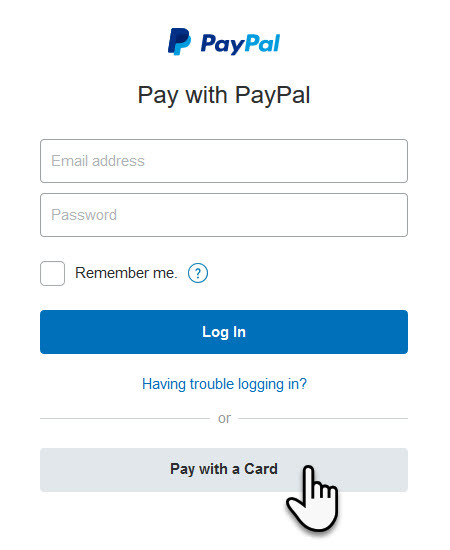 Select either the PayPal " Log In " or " Pay with a Card " option. If you do not have a PayPal account, all you need to do is click the grey button titled " Pay with a Card ". Then proceed to enter your Name, Address and Credit or Debit Card details. Your payment will then be processed. Check your email inbox to receive a receipt confirming your payment.